AllMax RapidCuts Femme - 42 capsules - Powerful Whole Body Transformation! 1. Target - Rapidcuts Femme targets metabolic functions and supports healthy insulin levels. 2. Release - a proprietary blend called LipoGlow releases fat from areas of stubborn stored fat by enhancing the body's key fat-release pathway which signals the cell fat cell to release stored fat. Once the fatty acids are released, they can then move to stage-3 (Ignite). 3. Ignite - LipoBurn™ is the last stage in the fat burning process. It has been designed to ignite and eliminate released fatty acids. Clinical research suggests that a key compound in LipoBurn™ increases fat burning. LipoBurn ensures released fat is naturally eliminated from the body as heat. 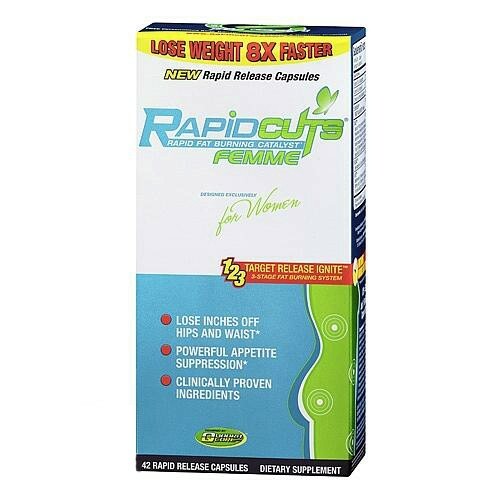 Rapidcuts Femme is an all-natural weight loss formula that was designed to accelerate fat burning specifically in women. This unique blend of two highly effective and potent complexes in Rapidcuts Femme work synergistically to accelerate fat loss at a cellular level. Rapidcuts Femme can help you manage your weight effectively, reduce physical and emotional cravings and increase metabolism of fats all in a convenient one-capsule dosage! Rapidcuts Femme is a female fat burner designed to Target, Release and Ignite stored body fat. Rapidcuts Femme features a new modern 3-Stage fat burning technology called T.R.I.™. This revolutionary approach to female body transformation is the new standard in fat reduction sciences. From the moment you take Rapidcuts Femme, you will feel it work and quickly begin to see your body transform in a matter of days. These three steps combined can help you lose weight like never before! This 3-stage fat burning technology is unique to Rapidcuts Femme and can help you take your weight loss to the next level. Rapidcuts Femme is not your average weight loss supplement. If you want to experience results you can see and feel include Rapidcuts Femme in your diet and exercise plan today! Take 1 capsule of Rapidcuts Femme 2 times daily on an empty stomach with 6-8 ounces of water. Take the first serving 30 minutes prior to first meal and the second serving 30 minutes prior to exercise or afternoon meal. Servingss should be separated by a minimum of 6 hours. On days that you do not exercise, take the first serving 30 minutes prior to breakfast and the second serving 30 minutes before afternoon meal. Researchers recommend you drink 8-12 cups of water daily, eat a healthy calorie reduced diet and exercise regularly for optimum results. Do not exceed 2 capsules in a 24 hour period. Discontinue use 2 weeks prior to surgery. Use for 12 weeks for optimum results.